PS4 version adds after story, side stories, and new party characters. 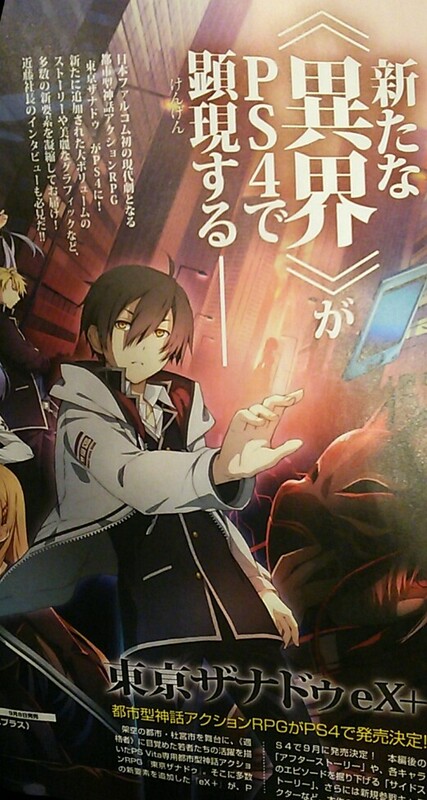 Falcom is bringing its PS Vita action RPG Tokyo Xanadu to PlayStation 4 in the form of Tokyo Xanadu eX+, the latest issue of Dengeki PlayStation reveals. It will launch in Japan on September 8 for 6,480 yen. The PlayStation 4 version of the game will run in full HD at 60 frames per second. It will include an after-story set several months after the events of the main game and side stories for each character (with the exception of Kou). The additional story volume is said to be equal to about two chapters of the main story. There are also new playable characters, including White Shroud and “Technique Unleashed State Asuka,” as well as others. White Shroud can explore dungeons on his own and uses the Light attribute, which is strong against all others outside of Shadow. He has high basic parameters and superior shooting, flight, and strength skills. Other additions include a “Calamity” difficulty mode (for a total of five difficulties: Beginner, Normal, Advanced, Elite, and Calamity), and Boss Time Attack and Boss Rush modes. Cross-save with the PS Vita version is not supported. Thanks, Re: Zaregoto and Hachima Kikou.